I'm Blogging for a Harper Free Canada. Grab a blog badge from Impolitical's site. I have to say that this design is really weak. First, the "joke" about the keys missing from the keyboard is too small to be visible in most web sized usage. 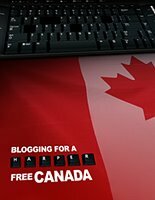 The visibility of "harper" keys is about the 3rd thing you see, so, 1st you see the FLAG, second most visible is BLogging for a Free Canada, third, harper. Then you read again (if you're still interested) and realize it says Blogging For a Harper Free Canada. It might work on a poster, but for web use, and blogs are web use, this is not a very good image. Why do you not support out troops?